We still need some ideas for Thanksgiving crafts. Although I love doing hand and foot print crafts I wanted to refrain from doing the hand print turkeys, just because I know many people already know how to do them. 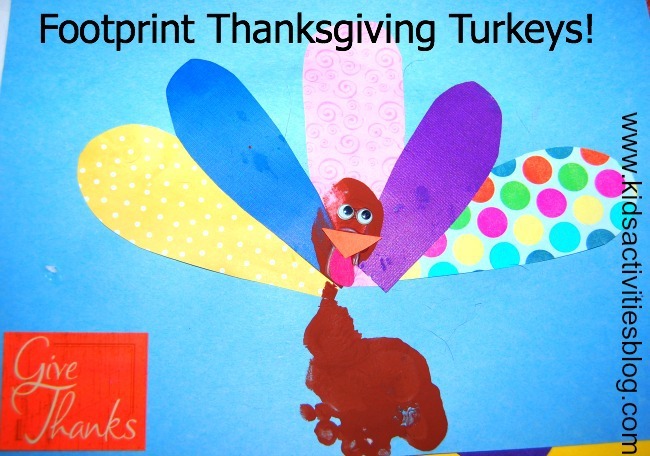 So, I decided to do a play  on the traditional hand print turkeys; we are making a foot print turkey! Kids Activities Blog loves colorful and creative (and easy) turkey crafts like this one. To begin with, I had Rory pick out different types of paper. Rory picked out the bright colorful pieces of scrap paper. I then cut these out into a feather shape; rounded and larger at the top and smaller at the bottom. When they are all cut out, have your child put some glue on the back of the feathers and arrange them on the construction paper. We chose to use five feathers, one a the top, two at the bottom, and two in between the top feather and the bottom feather. While they are drying, we cut out a triangle beaks out of the orange construction paper, and the turkey necks out of the red construction paper. I also grabbed some googly eyes for each of the turkeys. Once the turkeys are dry you can apply the beaks, necks, and eyes. We then added some Thanksgiving stickers. We can't wait to hang up our turkeys! I hope its not the last article about this topic , it absolutely was just a wonderful understand and hopefully we will all study far more about this !! Bookmarked dude!